As MRI systems expand into smaller community hospitals, MRI manufacturers are adjusting their product lines to serve those facilities with new equipment and upgrades. Many of the new MRI products introduced at RSNA 2014 were largely influenced by customers serving smaller communities and rural markets seeking high-quality imaging systems with a smaller footprint that improve productivity. The five major players—GE Healthcare, Siemens, Philips, Toshiba, and Hitachi—all had something new to offer. Here's a look at some of the newest innovations in MRI. Responding to the needs expressed above, Toshiba introduced the Vantage Elan MR system, a 1.5T MR system, designed to help providers save time, money, and space. Josh Emperado, Toshiba's senior manager for MR market development, says the Vantage Elan magnet and couch fit in a footprint of 23 square meters and it offers the lowest total cost of ownership. "The buzz we hear in the industry is about making the whole exam much more comfortable and patient friendly," Emperado says. "At the same time, MR technology is complex, and we need to make it easier for the customers. Our new system is quieter, more comfortable, and we've streamlined the process so patients spend the least amount of time possible and customers can perform them easier." Among its features are Toshiba's standard Pianissimo noise-reduction technology that's designed to help put patients at ease, a single set of coils that don't need to be readjusted for multiple exam types, and noncontrast imaging techniques allowing for safer exams. "Toshiba puts customers first with an MR system that delivers productivity, reliability, and high image quality, but can fit into the budgets of small community hospitals," says Nancy Gillen, vice president marketing and business development at Toshiba America Medical Systems. "We think hospitals of all sizes should be able to offer their patients the very best in imaging to enhance patient care and outcomes." At RSNA, Philips introduced Ingenia 1.5T S, a new addition to the Ingenia and dStream family specifically designed for medium- to large-scale hospitals that serve large patient volumes with high-performance MR imaging. It includes mDIXON XD, which provides fat-free imaging and four contrasts in one sequence in virtually all applications and anatomies, including subtractionless MR Angiography, whole body imaging, and even combinations of fat-free and motion-free imaging simultaneously; and O-MAR, a solution for excellent image quality, even for patients with orthopedic metal implants. "What makes Ingenia 1.5T S unique is that it addresses the root causes in a holistic way, delivering 'first time right' imaging for high productivity and a superb patient experience," says Annemarie Blotwijk, director of MR marketing for Philips Healthcare. "mDIXON XD and O-MAR improve MR speed and robustness to make MR more accessible to patients and new applications. It strengthens Philips' Premium IQ solution, which aims at delivering more diagnostic information in the available time slot." Philips also introduced new quantitative techniques in body and cardiac imaging to make MR a more definitive diagnostic solution, including MR elastography for the assessment of liver fibrosis and T2 or T1 mapping for cardiac disease assessment. "MR is a crucial and established imaging modality already today, but our customers see a huge potential to increase the impact of MR even more," Blotwijk says. "The future of MRI is in delivering faster, more definitive diagnosis, shortening the time to diagnosis with more definitive outcomes. This will be achieved by making MR procedures extremely fast and reliable and by making MR more patient friendly. It will also require more quantitative data and provide intelligent data analysis tools to provide definitive answers and enable personalized treatment plans." At RSNA, Philips demonstrated the concept study of an MRI coil that is not only fully digital but also features an integrated power supply. This allows a data-only connection of the coil, significantly speeding up the workflow. "In the future many MRI developments will be based in the software domain, arising from the coupling of digital data acquisition, reconstruction and postprocessing," Blotwijk says. "We believe that meaningful innovation starts with collaboration, which is why we developed a high-end reconstruction framework with a plug-and-play environment for new and custom reconstruction algorithms that also supports a graphical programming interface for our clinical research partners." The mandate around Hitachi's MRI systems in 2014 dealt with several industry trends that shaped the direction of its newest products. "MRI continues to move from qualitative to more quantitative assessment—such as techniques to visualize certain biomarkers and then map those over traditional anatomical images," says Shawn Warthman, MRI marketing director for Hitachi Medical Systems America. "Our new MRI platforms needed to meet diverse market segment needs. 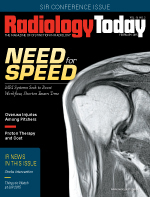 Like all imaging modalities, MRI is focused a lot on workflow enhancements, continuing to push exam times closer to 15 minutes from the norm of 30 minutes." At RSNA, Hitachi introduced new software designed to improve image quality, workflow and new clinical applications for its customers. These include a new k-space parallel processing scan method, improved fast spin-echo imaging, new fat suppression sequences, improved tuning and prescan set up, noncontrast tissue perfusion, white matter lesion detection, breast spectroscopy, and cardiac wall motion analysis. Key features in Hithachi's Echelon Oval 1.5T system include 74-cm oval bore, a 63-cm wide mobile patient table, and workflow-integrated technology with integrated coils and on-gantry monitor. "Our customers were asking for quieter scanning, metal artifact reduction sequences, and patient comfort features," Warthman says. "All of these features add to the patient comfort and workflow, allowing the patient to relax, which allows for a better scan and ultimately a better image for the radiologist." Stuart Schmeets, senior director of MR marketing at Siemens Healthcare, considers MRI a young modality because its potential is so limitless, and the company's latest products have focused on improving speed and clinical use. "The efficiency of health care has evolved, making the diagnosis faster, and some of the buzz in the industry has been, 'How can we increase speed for MRI?'" Schmeets says. "It's about collecting more information in less time and completing complex diagnoses." At RSNA, it unveiled its 1.5T Magnetom Amira MRI system, which was designed to speed up scans to as little as 10 minutes, while saving energy when the scanner is not in use. According to Schmeets, the system allows for 20% shorter exam slots, accommodates more patients per day, makes MRI expertise accessible to every technician, reduces the number of rescans with standard procedures, and minimizes complexity and maximizes efficiency for each MRI exam in an institution. Siemens also introduced its new, FDA-cleared 24-channel version of the Magnetom Skyra, Siemens' advanced wide-bore 3T MRI system. "The new configuration of the Skyra joins the previously available 48-channel version and has a lower cost entry point for customers looking to perform advanced clinical applications," Schmeets says. "We have a tremendous customer feedback program and that helps drive our R&D and where we are headed." Additionally, Siemens has in the pipeline its new, 510(k)-pending SEEit solution for prostate MRI exams, which will enable users to perform noninvasive prostate MRI without an endorectal coil. According to Schmeets, MRI has the highest sensitivity and specificity for assessing prostate cancer as it can rule out the presence of life-threatening cancer with more than 89% certainty. "Powerful coil technology and unique applications help to streamline processes and maximize system utilization," Schmeets says. Siemens continues to make use of its Day Optimizing Throughput MRI exam software, which provides intuitive protocol management designed to produce quality exams in less time, with the potential to shorten exam time up to 20%. GE Healthcare unveiled its new SIGNA Pioneer 3.0 Tesla MRI system that comes with a new imaging technique called MAGiC, which, according to Ioannis Panagiotelis, GE's global CMO, may reduce imaging times by up to two-thirds. "Our big thing was the return of [the] SIGNA [name], which we first introduced in 1983, with four new systems," Panagiotelis says. "It was always associated with leadership and innovation and this is a vision we want to bring back for MR."
The scanner features an enhanced version of GE's SilentScan technology, which originally was only available for neuro scans, but now makes most scans nearly completely silent. Additionally, the SIGNA Pioneer features Total Digital Imaging, which enables improved image quality and increases signal-to-noise ratio by up to 25%. With MAGiC, Panagiotelis explains, one can get six different image contrasts from one composition, taking a total of approximately five minutes, one-third of the time normally required. "We can actually go back after the scan and change the contrast," Panagiotelis says. "Let's say you made a mistake; you can simply move the contrast of the image you got and optimize the contrast. We think there will be a huge interest in MAGiC as it's a real answer to the needs of the customer today." Both the SIGNA Pioneer scanner and the MAGiC technology are pending FDA approval and have not yet received the CE mark. Two other systems GE will introduce in 2015 are the SIGNA Explorer and SIGNA Creator, the latter an entry-level, value-segment system. "We hear a lot of discussion about patient experiences and what can be done to make MR simpler to install, simpler to use and better overall," Panagiotelis says. "Customers want simplicity but don't want to sacrifice performance. We are always taking into account the cost position and improving speed and reliability."